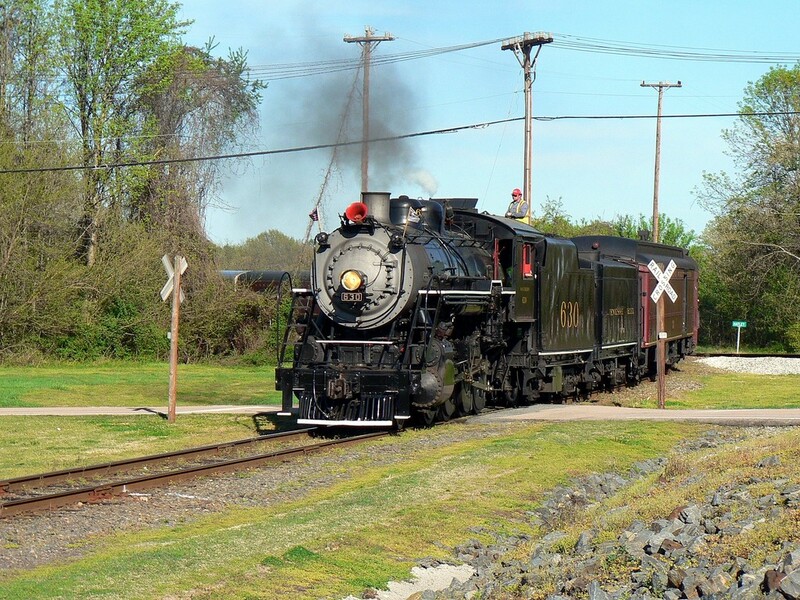 Built by the American Locomotive Company at Richmond, Virginia in 1904, the Southern #630 is a 2-8-0 Consolidation given a K-1 classification on its roster. 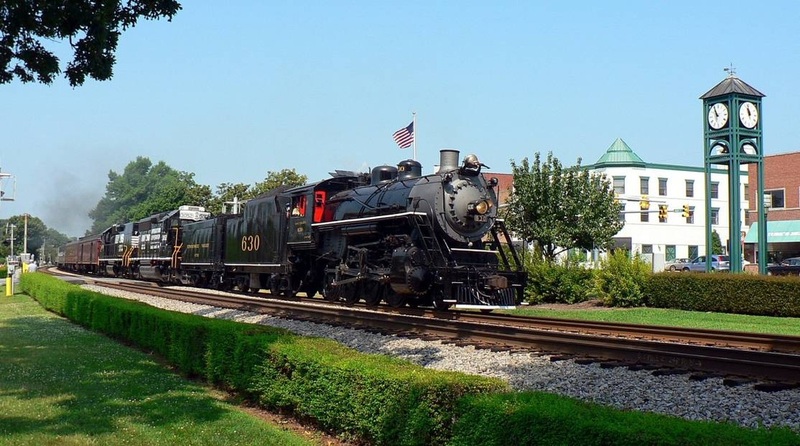 It served the railroad for nearly fifty years before retirement in 1952 when the Southern completed its rapid transition from steam to diesel. 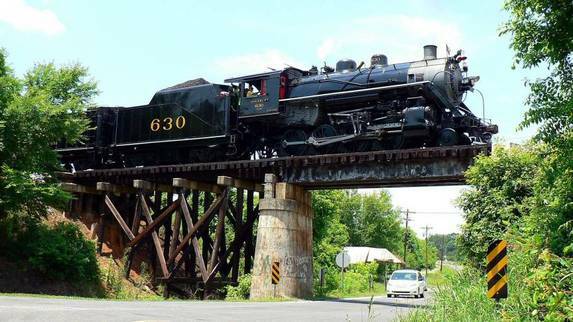 After retirement, the #630 was purchased by the East Tennessee & Western North Carolina railroad and remained its property until being traded to the Southern Railway for use in its steam excursion program. 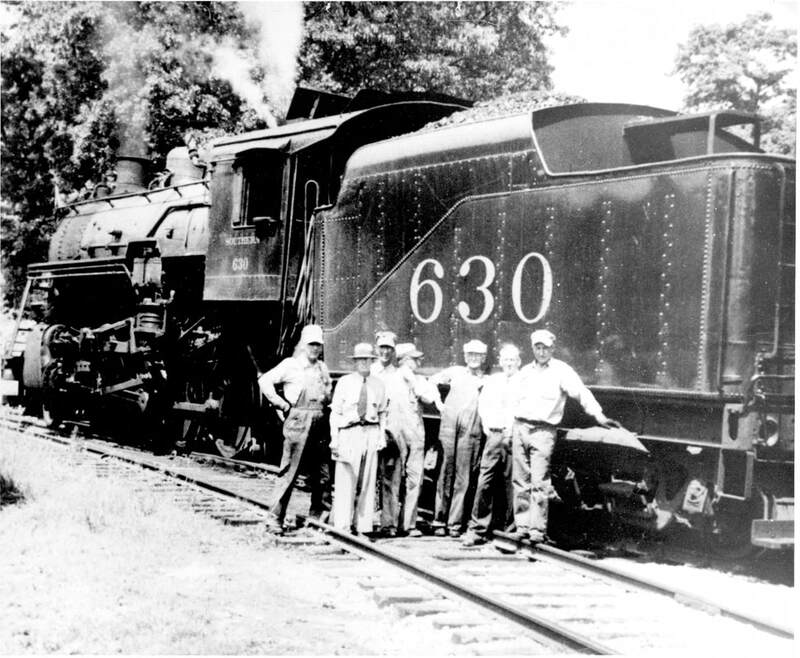 In exchange for the #630 and another steam locomotive, the ET&WNC received a pair of Alco RS-3s. 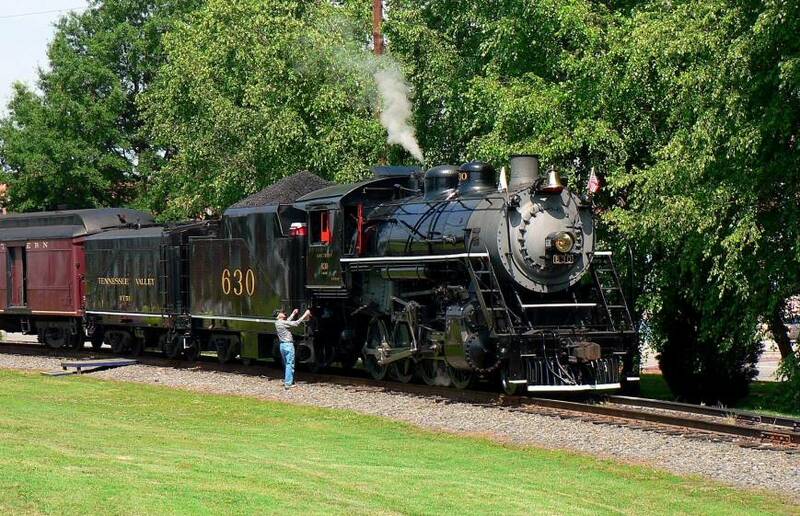 The Southern ended its mainline steam excursion program in 1983 and the #630 subsequently was leased to the Tennessee Valley Museum. 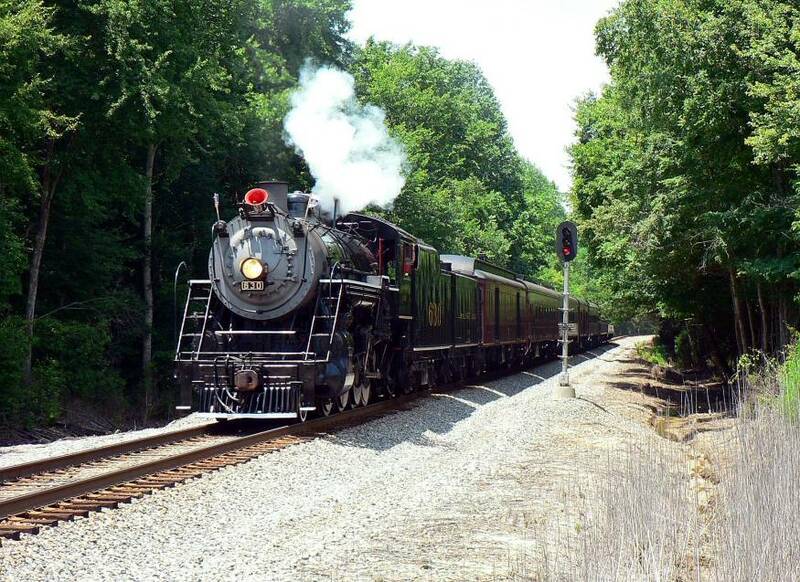 After various other uses and arrangements, the #630 was donated outright by Norfolk Southern to the TVM in 1999. 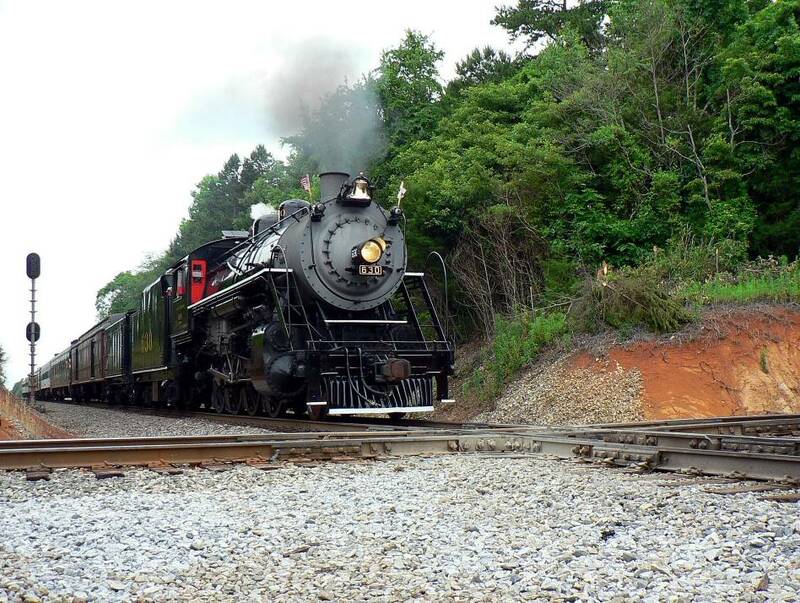 Shortly thereafter, she underwent a ten year restoration that was completed in March 2011. 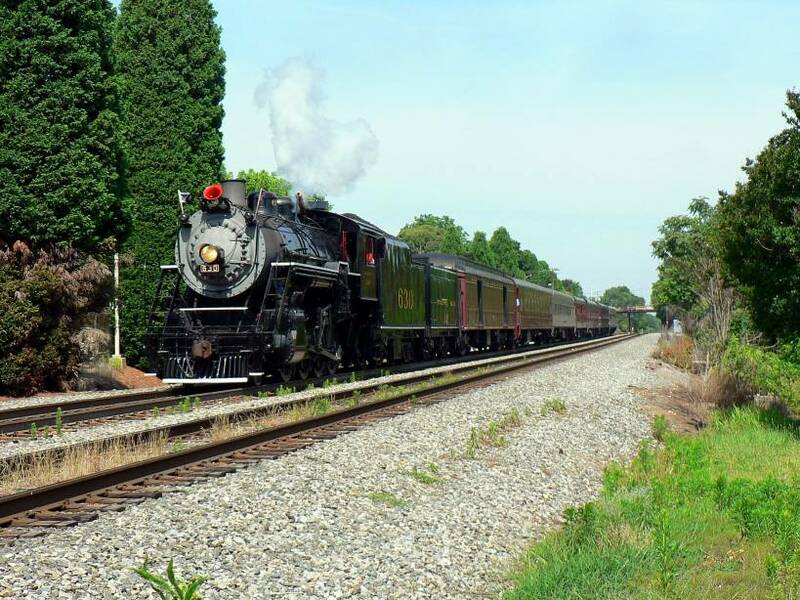 These runs transcend interest by only the die-hard rail enthusiast because of the nostalgic fascination with the steam locomotive. 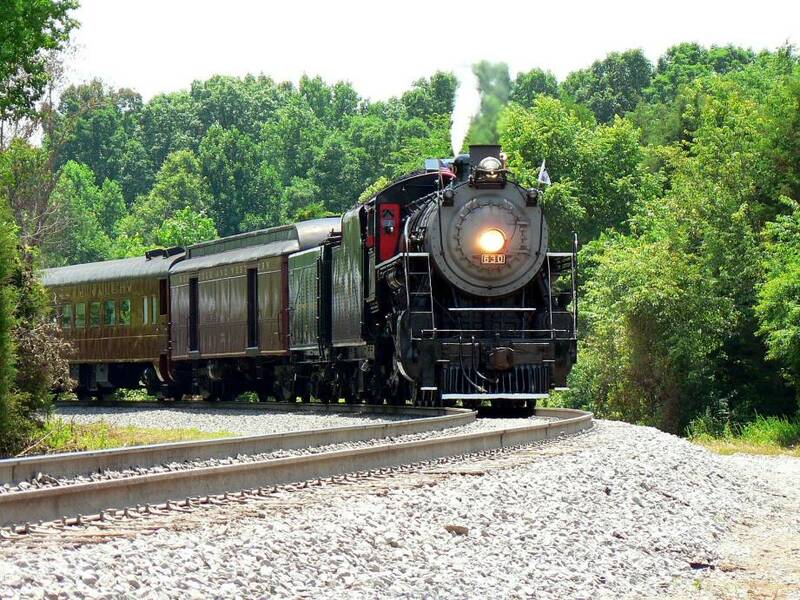 People that are generally disinterested with trains will stop and take notice as one runs by. 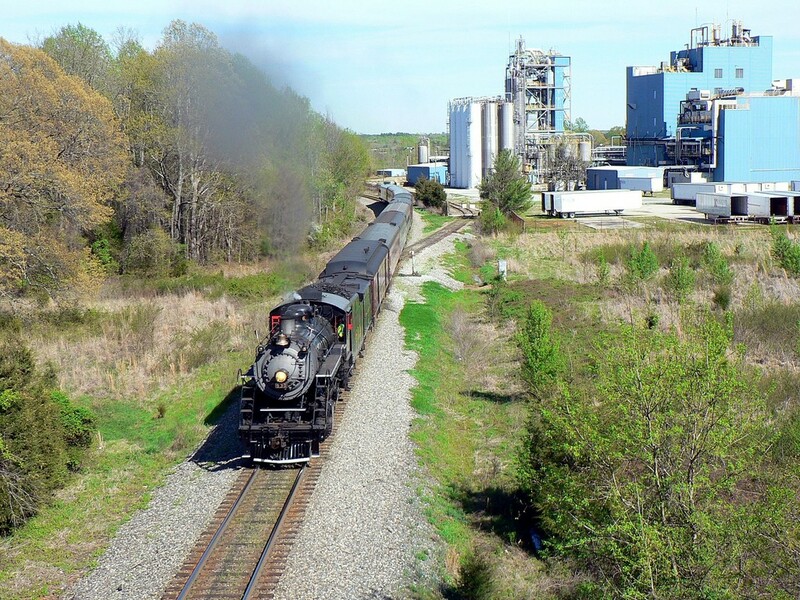 In the North Carolina region, steam last graced mainline rails in 1994 when the N&W #611 made its retirement run over the NS Piedmont Division en route to Roanoke. It has been a long two decades in waiting to witness this phenomenon again and the excursions did not disappoint. I took numerous photos over the period of a couple of weekends and selected my favorites of the lot to share here with any who are interested. Another view at the NCTM prior to the second departure for Barber later that afternoon on June 9. A NCTM volunteer is talking to the engineer before getting underway. 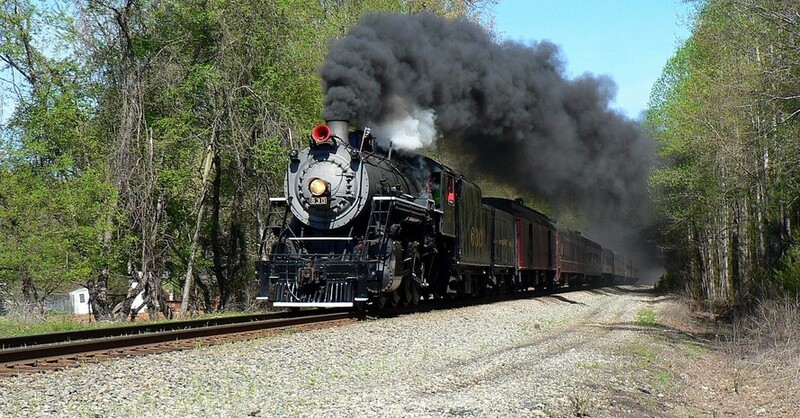 The magical allure of the steam locomotive is just as powerful in the 21st century as it was in the past. Big events draw many people and often it is difficult to get "clean" photos. I had set up to take the photo here at the Salisbury station on the Council Street side and as the train approached, the young man in the image ran into the center of the scene to take his photo. I'm glad he got his photo---just as I am still happy with this one. It is what it is and no point getting upset about it. One negative about photographing trains between Salisbury and Barber is limited trackside access from public property. Otherwise, it is a photogenic route and especially so as one moves west towards Asheville. Barber, or Barber Junction as it is commonly referred as, is a unique location in that it still has nostalgic feel. The surroundings are rural and is often the case, very few changes occur over the course of time. 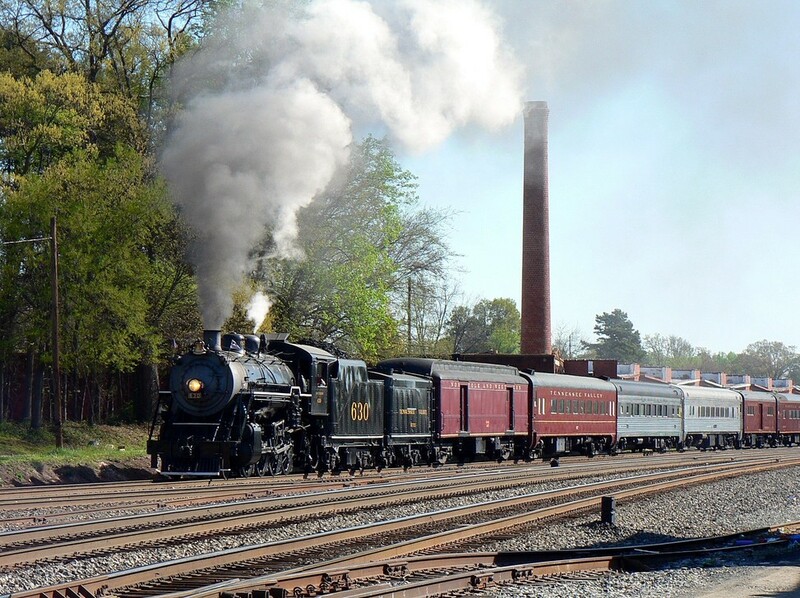 Situated at the junction of the NS "S line (Salisbury-Asheville) and the NS "L" and "O" lines (Charlotte-Winston-Salem), it also hosts a small yard and is the home base for locals operating to Mooresville and Mocksville. A brick depot still remains at the junction as well. 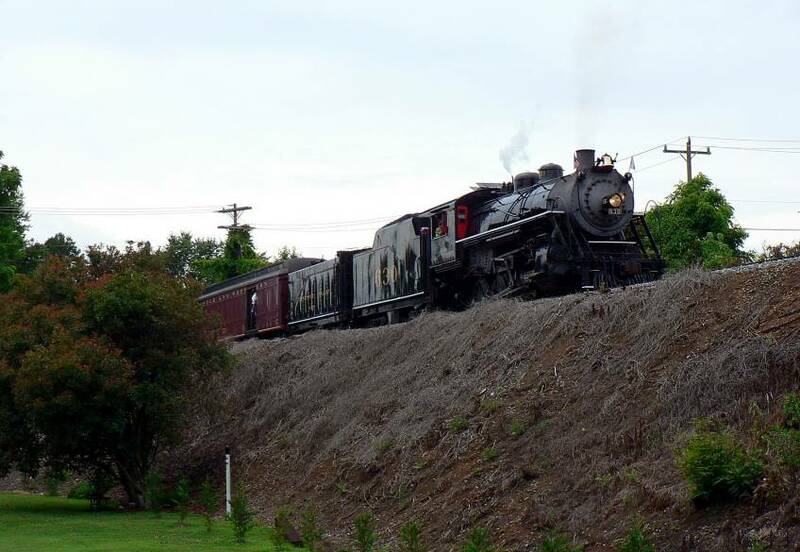 Because of its unique track layout and relative easy access, this location has long been a favorite spot for train watchers and photographers alike. 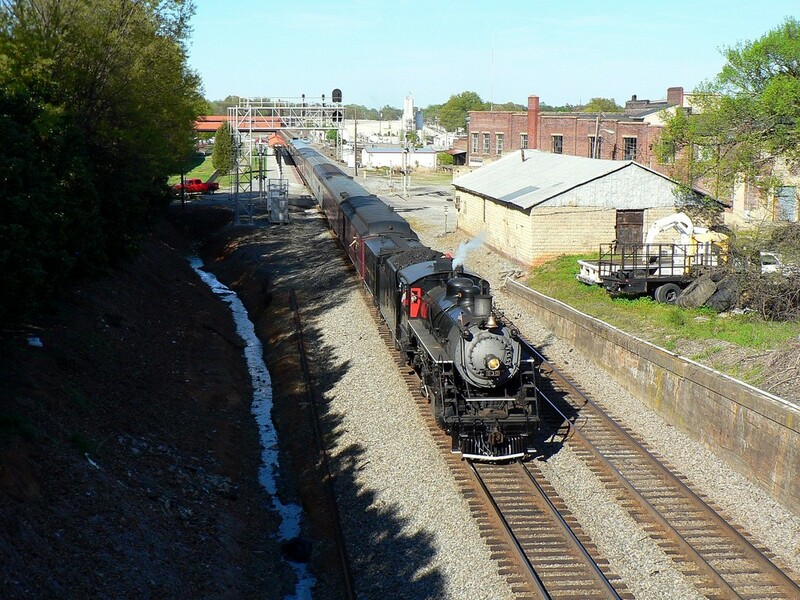 A couple of weeks after the Spencer-Barber excursions, I ventured to Thomasville to take a photo of the train on a Spencer-Winston Salem run. The notable change with these excursions was the addition of diesel road power to assist the #630 since this was a longer trip. 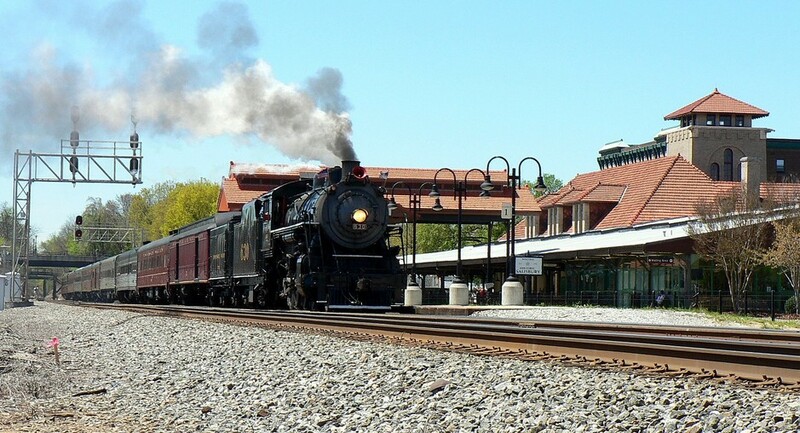 The train did not return to Spencer; hence, it was a one way ticket with the riders bussed home for the return. The #630 revisited Spencer on the weekend of April 12-13, 2013. 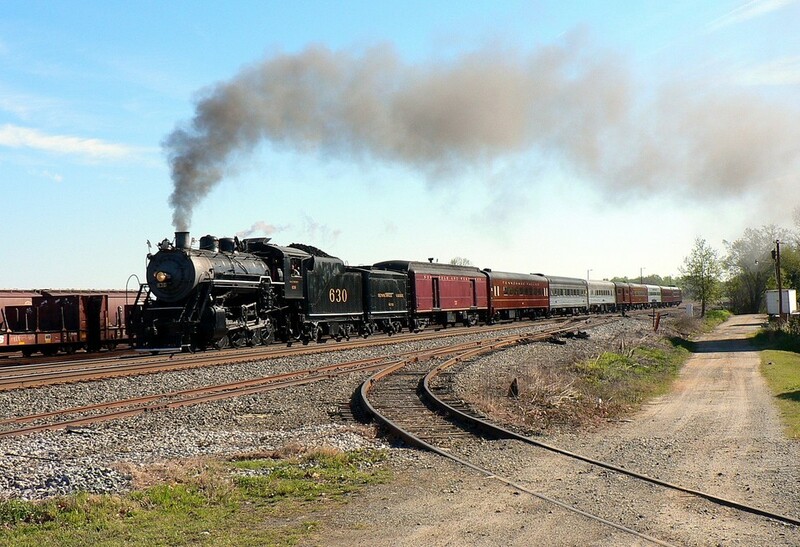 Three separate excursions were operated once again between the NCTM and Barber Junction on April 12. 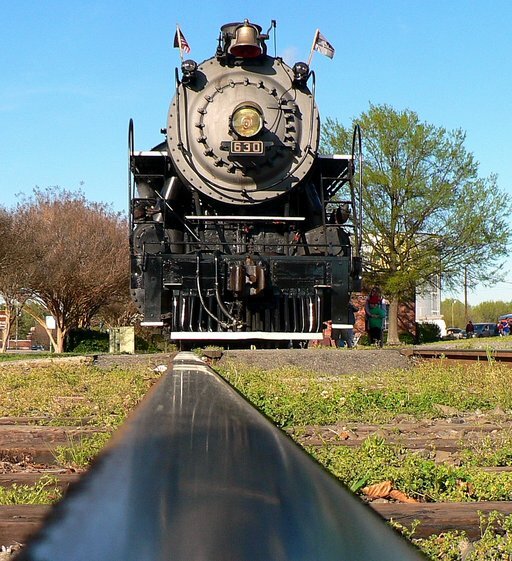 On April 13, the locomotive was the star attraction for the North Carolina Transportation Museum itself for excursions on its property for the day. One dramatic change about the #630 in 2013 is heavier plume from the exhaust which added to the photographic element. Compare this and the selected images below to the ones from 2012 above and there is definitely a difference. As in 2012, this was a wonderful event to witness. The weather was absolutely perfect and without question it was a major contributor to the volume of trackside turnout this year. My goal this year was to photograph it at different locations than in 2012. 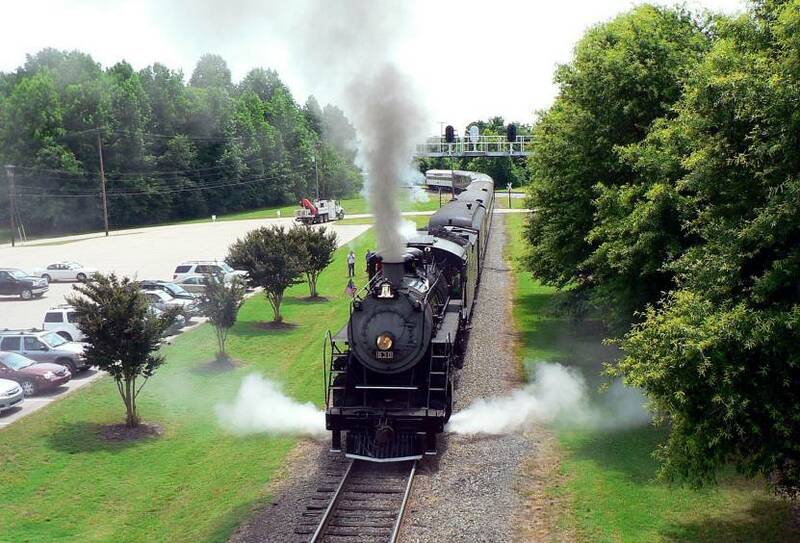 The country as it was when dominated by the steam locomotive was a fascinating time. Some will argue that it was a more environmentally compromised period and it is true that the railroad added its share of pollution. But these living machines literally built the industrialized America of the past and all those who operated and serviced these marvels were no less than a hearty lot. Restored beauties such as the #630 provide a tangible connection to this bygone era that several generations now do not know. Watching the #630 has left me with conflicting emotions. Here I am thrilled to be with my son Matt who is as avid about trains as I am and had yearned to see steam on a Class I mainline. 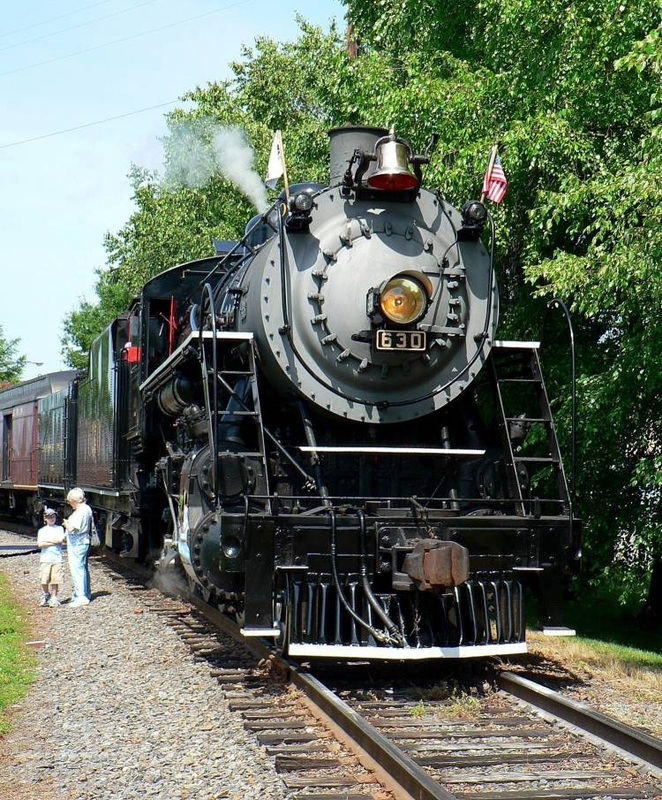 Yet at the same time there were also tears as I reminisced about the C&O 614 and Nickel Plate #765 from years ago in West Virginia and how special it was for my dad to be standing beside me for them. A passing of the torch so to speak. Wikipedia for the Southern Railway #630 historical content.